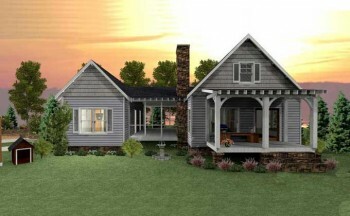 Oak Mountain Cottage is a 1 story 3 bedroom house plan with a 2 car garage that will work great as your vacation or primary home. 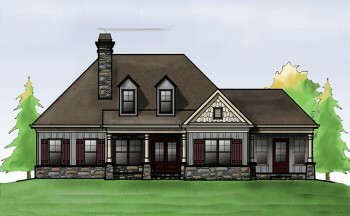 You enter the foyer to a dining room, vaulted family room, fireplace and views out the rear of the house. On the right side of the house you will find split bedrooms, both with their own closet and access to a bathroom in the hallway. The two car garage on the front has plenty of room for storage and easy access to the kitchen and master suite. The upper level is an unfinished bonus room not included in the square footage of the plan.